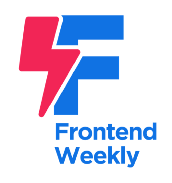 Want to write for Frontend Weekly and reach over 20k followers? Help us improve this publication and newsletter. Progressive web apps can, in theory, give fantastic app-like experiences, but it’s a standard that strayed far from its roots. I’m so f****in’ grateful for this spec. Modular iteration without cloning or modifying in-place. AI based natural language processing can be incredibly powerful when deployed well. Here’s a case study on a recent project of ours.